This article is about the musical. For other uses, see Guys and Dolls (disambiguation). Guys and Dolls is a musical with music and lyrics by Frank Loesser and book by Jo Swerling and Abe Burrows. It is based on "The Idyll of Miss Sarah Brown" and "Blood Pressure" – two short stories by Damon Runyon, – and also borrows characters and plot elements from other Runyon stories – most notably "Pick the Winner". Guys and Dolls was selected as the winner of the 1951 Pulitzer Prize for Drama. However, because of writer Abe Burrows' troubles with the House Un-American Activities Committee (HUAC), the Trustees of Columbia University vetoed the selection, and no Pulitzer for Drama was awarded that year. Guys and Dolls was conceived by producers Cy Feuer and Ernest Martin as an adaptation of Damon Runyon's short stories. These stories, written in the 1920s and 1930s, concerned gangsters, gamblers, and other characters of the New York underworld. Runyon was known for the unique dialect he employed in his stories, mixing highly formal language and slang. Frank Loesser, who had spent most of his career as a lyricist for movie musicals, was hired as composer and lyricist. George S. Kaufman was hired as director. When the first version of the show's book, or dialogue, written by Jo Swerling was deemed unusable, Feuer and Martin asked radio comedy writer Abe Burrows to write a new version of the book. Frank Loesser's fourteen songs were all great, and the [new book] had to be written so that the story would lead into each of them. Later on, the critics spoke of the show as 'integrated'. The word integration usually means that the composer has written songs that follow the story line gracefully. Well, we accomplished that but we did it in reverse. The character of Miss Adelaide was created specifically to fit Vivian Blaine into the musical, after Loesser decided she was ill-suited to play the conservative Sarah. When Loesser suggested reprising some songs in the second act, Kaufman warned: "If you reprise the songs, we’ll reprise the jokes." A pantomime of never-ceasing activities depicts the hustle and bustle of New York City ("Runyonland"). Three small-time gamblers, Nicely-Nicely Johnson, Benny Southstreet, and Rusty Charlie, argue over which horse will win a big race ("Fugue for Tinhorns"). The band members of the Save-a-Soul Mission, led by the pious and beautiful Sergeant Sarah Brown, call for sinners to "Follow the Fold" and repent. Nicely and Benny's employer, Nathan Detroit, runs an illegal floating crap game. Due to local policeman Lt. Brannigan's strong-armed police activity, he has found only one likely spot to hold the game: the "Biltmore garage." However, the owner, Joey Biltmore, requires a $1,000 security deposit, and Nathan is broke ("The Oldest Established"). Nathan hopes to get $1,000 by winning a bet against Sky Masterson, a gambler willing to bet on virtually anything. Nathan proposes a bet which he believes he cannot lose: Sky must take a doll (a woman) of Nathan's choice to dinner in Havana, Cuba. Sky agrees, and Nathan chooses Sarah Brown. At the mission, Sky claims he wants to be saved, impressing Sarah with his knowledge of the Bible. He offers Sarah a deal: He will bring the mission "one dozen genuine sinners" if she will accompany him to Havana the next night. Sarah rebuffs him, telling him that she plans to fall in love with an upright, moral man. Sky replies that he plans on being surprised when he falls in love ("I'll Know"). Sky kisses Sarah, and she slaps him. Nathan goes to watch his fiancée of 14 years, Miss Adelaide, perform her nightclub act ("A Bushel and a Peck"). After her show, she asks him, as she has many times before, to go down to city hall and get a marriage license. She is distraught to find out that Nathan is still running the crap game. She consults a medical book, which tells her that her chronic cold is a psychosomatic reaction to her frustration with Nathan's failure to marry her ("Adelaide's Lament"). The next day, Nicely and Benny watch as Sky pursues Sarah, and Nathan tries to win back Adelaide's favor. They declare that guys will do anything for the dolls they love ("Guys and Dolls"). General Cartwright, the leader of the Save-a-Soul organization, visits the mission and explains that she will be forced to close the branch unless they succeed in bringing some sinners to the upcoming revival meeting. Sarah, desperate to save the mission, promises the General "one dozen genuine sinners", implicitly accepting Sky's deal. The gamblers, including a notorious gangster from Chicago named Big Jule, are waiting for Nathan to secure the spot for the game and Lt. Brannigan becomes suspicious. To convince him of their innocence, they tell Brannigan their gathering is Nathan's "surprise bachelor party". This satisfies Brannigan, and Nathan resigns himself to eloping with Adelaide. Adelaide goes home to pack, promising to meet him after her show the next afternoon. The Save-A-Soul Mission band passes by, and Nathan sees that Sarah is not in it; he realizes that he lost the bet and faints. In a Havana nightclub, Sky buys a drink for himself and a "Cuban milkshake" for Sarah. She doesn't realize that the drink contains Bacardi rum, and she innocently drinks multiple glasses, becoming progressively tipsier. Outside the club, Sarah kisses Sky and proclaims that she is truly enjoying herself for the first time in her life ("If I Were a Bell"). She wants to stay in Havana with Sky. Sky is surprised to find, though, that he truly cares about Sarah's welfare, and he insists that they go back to the airport and return to New York. Back in New York, it is 4:00 a.m., and as Sky and Sarah (now sober) stand in the street outside the mission, Sky explains that this is his favorite time of day, and Sarah is the only woman he's ever wanted to share it with him ("My Time of Day"). They both spontaneously admit that they're in love ("I've Never Been in Love Before"). A siren rings out and gamblers run out of the mission, where Nathan has been holding the crap game. Sarah assumes that Sky took her to Havana and pretended to be in love with her just so Nathan could use the mission for the game, rejecting his protests of innocence. The next evening, Adelaide performs her act at the Hot Box ("Take Back Your Mink"). Nathan doesn't show up for the elopement because he's still running the crap game. She soon realizes that Nathan has stood her up again and turns to her book for comfort ("Adelaide's Second Lament"). Sarah admits to Arvide Abernathy, who is her grandfather and fellow mission worker, that she loves Sky but will never see him again because she believes he is responsible for the previous night's crap game. Abernathy expresses his faith in Sky's inherent goodness and urges Sarah to follow her heart ("More I Cannot Wish You"). Sky tells Sarah he intends to deliver the dozen genuine sinners for the revival. She doesn't believe him and walks off, but Arvide subtly encourages him. Nicely shows Sky where the game is being held: the sewer ("Crapshooters Dance"). Big Jule has lost a large amount of cash and insists on playing on credit. To change his luck he uses his own dice which are blank and proceeds to cheat Nathan out of all of his money. Sky then arrives with Nicely. Big Jule isn't impressed in the slightest but Sky responds by punching him out. He then gives Nathan $1,000, saying that Nathan won the bet and implying that Sarah refused to go to Havana with him. Sky, determined to get the dozen sinners he promised Sarah, bets every man at the game a thousand dollars against their souls. If he loses, everyone gets a thousand dollars each, but if he wins, they must all attend the revival at the mission ("Luck Be a Lady"). He tosses the dice. The gamblers head towards the mission, and it is clear that Sky has won his bet. On his way there, Nathan runs into Adelaide and tells her that he has to attend the prayer meeting. Adelaide does not believe him. She asks herself why she keeps putting up with Nathan's lies, and he tells her that he loves her ("Sue Me"). Sky and the gamblers arrive at the mission, much to Sarah's surprise. General Cartwright asks if anyone wishes to give testimony to their sins. Benny and Big Jule testify but another gambler named Harry The Horse lets slip that Sky only got them to the meeting because he won their souls in a dice game. The General is very pleased by this as it shows that good can come out of evil. Attempting to appear contrite, Nicely invents a dream which encouraged him to repent, and the gamblers join in with revivalist fervor ("Sit Down, You're Rockin' the Boat"). Brannigan arrives and threatens to arrest everyone for the crap game in the Mission, but Sarah clears them, saying that none of the gamblers were at the mission the previous night. After Brannigan leaves, Nathan gives testimony and confesses that they held the crap game in the mission. He also confesses the bet he made with Sky about taking Sarah to Havana. He adds that he won the bet, to Sarah's shock, and she realizes that Sky wanted to protect her reputation and must genuinely care about her. Sarah and Adelaide run into each other, and they commiserate and then resolve to marry their men anyway and reform them later ("Marry the Man Today"). Several weeks later, Nathan has opened a newsstand and is going to marry Adelaide at the mission. Sky and Sarah have just been married, and Sky is playing in the mission band ("Guys and Dolls" (Finale/Reprise)). The musical premiered on Broadway at the 46th Street Theatre on November 24, 1950. It was directed by George S. Kaufman, with dances and musical numbers by Michael Kidd, scenic and lighting design by Jo Mielziner, costumes by Alvin Colt, and orchestrations by George Bassman and Ted Royal, with vocal arrangements by Herbert Greene It starred Robert Alda (Sky), Sam Levene (Nathan), Isabel Bigley (Sarah), and Vivian Blaine (Adelaide). Iva Withers was a replacement as Adelaide. The musical ran for 1,200 performances, winning five 1951 Tony Awards, including the award for Best Musical. Decca Records issued the original cast recording on 78 rpm records, which was later expanded and re-issued on LP, and then transferred to CD in the 1980s. The West End premiere opened at the London Coliseum on May 28, 1953 and ran for 555 performances. The cast starred Vivian Blaine, Sam Levene, Lizbeth Webb and Jerry Wayne. Lizbeth Webb was the only major principal who was British and was chosen to play the part of Sarah Brown by Frank Loesser. The show has had numerous revivals and tours and has become a popular choice for school and community theatre productions. New York City Center mounted short runs of the musical in 1955, 1965 and 1966. A production starring Walter Matthau as Nathan Detroit, Helen Gallagher as Adelaide, Ray Shaw as Sky and Leila Martin as Sarah had 31 performances, running from April 20 to May 1, and May 31 to June 12, 1955. Another presentation at City Center, with Alan King as Nathan Detroit, Sheila MacRae as Adelaide, Jerry Orbach as Sky and Anita Gillette as Sarah, ran for 15 performances from April 28 to May 9, 1965. A 1966 production, starring Jan Murray as Nathan Detroit, Vivian Blaine reprising her role as Adelaide, Hugh O'Brian as Sky, and Barbara Meister as Sarah, ran for 23 performances, from June 8 to June 26, 1966. An all-black cast staged the first Broadway revival of the show, which opened on July 11, 1976 in previews, officially on July 21, at The Broadway Theatre. It starred Robert Guillaume as Nathan Detroit, Norma Donaldson as Miss Adelaide, James Randolph as Sky and Ernestine Jackson as Sarah Brown. Guillaume and Jackson were nominated for Tony and Drama Desk Awards, and Ken Page as Nicely-Nicely won a Theatre World Award. This production featured Motown-style musical arrangements by Danny Holgate and Horace Ott, and it was directed and choreographed by Billy Wilson. The entire production was under the supervision of Abe Burrows, and musical direction and choral arrangements were by Howard Roberts. The show closed on February 13, 1977 after 239 performances and 12 previews. A cast recording was released subsequent to the show's opening. Laurence Olivier had wanted to play Nathan Detroit, and began rehearsals for a planned 1971 London revival of Guys and Dolls at his National Theatre Company's Old Vic theatre. However, due to poor health he had to stop, and his revival never saw the light of day. In 1982, Richard Eyre directed a major revival at London's National Theatre. Eyre called it a "re-thinking" of the musical, and his production featured an award-winning neon-lit set design inspired by Rudi Stern's 1979 book Let There Be Neon, and brassier orchestrations with vintage yet innovative harmonies. The show's choreography by David Toguri included a large-scale tap dance number of the "Guys and Dolls" finale, performed by the principals and entire cast. The revival opened March 9, 1982, and was an overnight sensation, running for nearly four years and breaking all box office records. The original cast featured Bob Hoskins as Nathan Detroit, Julia McKenzie as Adelaide, Ian Charleson as Sky and Julie Covington as Sarah. The production won five Olivier Awards, including for McKenzie and Eyre and for Best Musical. Eyre also won the Evening Standard Award, and Hoskins won the Critics' Circle Theatre Award. In October 1982, Hoskins was replaced by Trevor Peacock, Charleson by Paul Jones, and Covington by Belinda Sinclair; in the spring of 1983 McKenzie was replaced by Imelda Staunton and Fiona Hendley replaced Sinclair. This production closed in late 1983 to make way for a Broadway try-out of the ill-fated musical Jean Seberg, which following critical failure closed after four months. Eyre's Guys and Dolls returned to the National from April through September 1984, this time starring Lulu, Norman Rossington, Clarke Peters and Betsy Brantley. After a nationwide tour, this production transferred to the West End at the Prince of Wales Theatre, where it ran from June 1985 to April 1986. Following Ian Charleson's untimely death from AIDS at the age of 40, in November 1990 two reunion performances of Guys and Dolls, with almost all of the original 1982 cast and musicians, were given at the National Theatre as a tribute to Charleson. The tickets sold out immediately, and the dress rehearsal was also packed. The proceeds from the performances were donated to the new Ian Charleson Day Centre HIV clinic at the Royal Free Hospital, and to scholarships in Charleson's name at LAMDA. The 1992 Broadway revival was the most successful American remounting of the show since its original opening. Directed by Jerry Zaks, it starred Nathan Lane as Nathan Detroit, Peter Gallagher as Sky, Faith Prince as Adelaide and Josie de Guzman as Sarah. This production played at the Martin Beck Theatre from April 14, 1992 to January 8, 1995, with 1,143 performances. The production received a rave review from Frank Rich in The New York Times, stating "It's hard to know which genius, and I do mean genius, to celebrate first while cheering the entertainment at the Martin Beck." It received eight Tony Award nominations, and won four, including Best Revival, and the show also won the Drama Desk Award for Outstanding Revival. This revival featured various revisions to the show's score, including brand new music for the "Runyonland", "A Bushel and a Peck," "Take Back Your Mink" and "Havana". The orchestrations were redesigned by Michael Starobin, and there were new dance arrangements added to "A Bushel and a Peck" and "Take Back Your Mink". A one-hour documentary film captured the recording sessions of the production's original cast album. 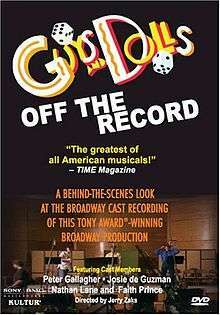 Titled Guys and Dolls: Off the Record, the film aired on PBS's Great Performances series in December 1992, and was released on DVD in 2007. Complete takes of most of the show's songs are featured, as well as coaching from director Zaks, and commentary sessions by stars Gallagher, de Guzman, Lane, and Prince on the production and their characters. Richard Eyre repeated his 1982 success with another National Theatre revival of the show, this time in a limited run. It starred Henry Goodman as Nathan Detroit, Imelda Staunton returning as Adelaide, Clarke Peters returning as Sky and Joanna Riding as Sarah. Clive Rowe played Nicely-Nicely Johnson, and David Toguri returned as choreographer. The production ran from December 17, 1996 through March 29, 1997 and from July 2, 1997 to November 22, 1997. It received three Olivier Award nominations, winning one: Best Supporting Performance in a Musical went to Clive Rowe. Richard Eyre won the Critics' Circle Theatre Award for Best Director, and the production won Best Musical. The 2005 West End revival opened at London's Piccadilly Theatre in June 2005 and closed in April 2007. This revival, directed by Michael Grandage, starred Ewan McGregor as Sky, Jenna Russell as Sarah, Jane Krakowski as Adelaide, and Douglas Hodge as Nathan Detroit. During the run, Nigel Harman, Adam Cooper, Norman Bowman and Ben Richards took over as Sky; Kelly Price, Amy Nuttall and Lisa Stokke took over as Sarah; Sarah Lancashire, Sally Ann Triplett, Claire Sweeney, Lynsey Britton and Samantha Janus took over as Adelaide; and Nigel Lindsay, Neil Morrissey, Patrick Swayze, Alex Ferns and Don Johnson took over as Nathan Detroit. This production added the song "Adelaide" that Frank Loesser had written for the 1955 film adaptation. According to a September 2007 article in Playbill.com, this West End production had been scheduled to begin previews for a transfer to Broadway in February 2008, but this plan was dropped. A 2009 Broadway revival of the show opened on March 1, 2009 at the Nederlander Theatre. The cast starred Oliver Platt as Nathan Detroit, Lauren Graham, in her Broadway debut, as Adelaide, Craig Bierko as Sky and Kate Jennings Grant as Sarah. Des McAnuff was the director, and the choreographer was Sergio Trujillo. The show opened to generally negative reviews. The New York Times called it "static" and "uninspired", the New York Post said, "How can something so zippy be so tedious?" and Time Out New York wrote, "Few things are more enervating than watching good material deflate." However, the show received a highly favorable review from The New Yorker, and the producers decided to keep the show open in hopes of positive audience response. The New York Post reported on March 4 that producer Howard Panter "[said] he'll give Guys and Dolls at least seven weeks to find an audience." The revival closed on June 14, 2009 after 28 previews and 113 performances. A revival opened at the 2015 Chichester Festival. This moved to Manchester and Birmingham before moving onto a West End opening at the Savoy Theatre on December 10, 2015 for previews with a full opening on January 6, 2016 until March 12, 2016. The production stars Sophie Thompson as Adelaide and Jamie Parker as Sky. The production then transferred to the Phoenix Theatre, with Oliver Tompsett as Sky, Samantha Spiro as Adelaide and Richard Kind as Nathan. On June 28, 2016, the role of Miss Adelaide was taken over by Rebel Wilson, and Nathan Detroit was played by Simon Lipkin. The tour continues around UK cities and Dublin. In 1995, a Las Vegas production, performed without intermission, starred Jack Jones, Maureen McGovern and Frank Gorshin. Charles Randolph-Wright directed a production at Washington’s Arena Stage, starring Maurice Hines (Nathan Detroit) and Alexandra Foucard (Adelaide), opening on December 30, 1999. The production received six Helen Hayes Award nominations. With support from Jo Sullivan Loesser, the production began a national tour in August 2001. The cast recording from this production, released in November 2001, was nominated for the Grammy Award for Best Musical Show Album. An Australian remount of the Michael Grandage West End production of Guys and Dolls opened in Melbourne, Australia on April 5, 2008. The show starred Lisa McCune, Marina Prior, Garry McDonald, Ian Stenlake, Shane Jacobson, Wayne Scott Kermond, and Magda Szubanski, and ran at the Princess Theatre. The Melbourne season closed in August 2008 and transferred to Sydney from March 13, 2009 to May 31, 2009 at the Capitol Theatre, retaining the Melbourne cast. In August 2009, a concert version ran at The Hollywood Bowl, Hollywood, California, starring Scott Bakula (Nathan Detroit), Brian Stokes Mitchell (Sky Masterson), Ellen Greene (Miss Adelaide), and Jessica Biel (Sarah Brown). In February 2011, a co-production between Clwyd Theatr Cymru, the New Wolsey Theatre and the Salisbury Playhouse opened at Clwyd Theatr. Directed by Peter Rowe and with music direction by Greg Palmer and choreography by Francesca Jaynes, the show was performed by a cast of 22 actor-musicians, with all music played live on stage by the cast. The show also toured Cardiff, Swansea, and other Welsh cities as well as some English cities, receiving a positive review in The Guardian. A concert performance ran at London's Cadogan Hall from 22–25 August 2012, featuring Dennis Waterman, Ruthie Henshall, Anna-Jane Casey, and Lance Ellington (Strictly Come Dancing), with musical director Richard Balcombe and the Royal Philharmonic Concert Orchestra and Choir. In April 2014, a one-night-only performance took place at Carnegie Hall, starring Nathan Lane reprising the role that made him a star, Megan Mullally, Patrick Wilson and Sierra Boggess. It was directed by Jack O'Brien and featured the St.Luke's Orchestra playing the original orchestrations. The original Broadway production of Guys and Dolls opened to unanimously positive reviews. Critics praised the musical's faithfulness to Damon Runyon's style and characterizations. Richard Watts of the New York Post said "Guys and Dolls is just what it should be to celebrate the Runyon spirit...[it is] filled with the salty characters and richly original language sacred to the memory of the late Master". William Hawkins of the New York World-Telegram & Sun stated, "It recaptures what [Runyon] knew about Broadway, that its wickedness is tinhorn, but its gallantry is as pure and young as Little Eva". Robert Coleman of the New York Daily Mirror declared, "We think Damon would have relished it as much as we did". The book and score were greatly praised as well; John Chapman of the Daily News declared, "The book is a work of easy and delightful humor. Its music and lyrics, by Frank Loesser, are so right for the show and so completely lacking in banality, that they amount to an artistic triumph". Coleman stated, "Frank Loesser has written a score that will get a big play on the juke boxes, over the radio, and in bistros throughout the land. His lyrics are especially notable in that they help Burrows's topical gags to further the plot". In The New York Times, Brooks Atkinson wrote, "Mr. Loesser's lyrics and songs have the same affectionate appreciation of the material as the book, which is funny without being self-conscious or mechanical". Multiple critics asserted that the work was of great significance to musical theatre. John McClain of the New York Journal American proclaimed, "it is the best and most exciting thing of its kind since Pal Joey. It is a triumph and a delight". Atkinson stated, "we might as well admit that Guys and Dolls is a work of art. It is spontaneous and has form, style, and spirit." Chapman asserted, "In all departments, Guys and Dolls is a perfect musical comedy". On November 3, 1955 the film version of the musical was released, starring Marlon Brando as Sky, Frank Sinatra as Nathan Detroit, and Jean Simmons as Sarah, with Vivian Blaine reprising her role as Adelaide. The film was directed by Joseph L. Mankiewicz and produced by Samuel Goldwyn. Three new songs, written by Frank Loesser, were added to the film: "Pet Me Poppa"; "A Woman in Love"; and "Adelaide", which was written specifically for Sinatra. Five songs from the stage musical were omitted from the movie: "A Bushel and a Peck", "My Time of Day", "I've Never Been In Love Before", "More I Cannot Wish You", and "Marry the Man Today". 20th Century Fox acquired the film rights to the musical in early 2013, and plan to cast Channing Tatum and Joseph Gordon-Levitt in a remake of Guys and Dolls. 1 2 Nadel, Ira Bruce. Double act: a life of Tom Stoppard. Methuen, 2002. p. 542. ↑ "Damon Runyon". Authors. The eBooks-Library. Retrieved 2008-07-20. 1 2 Zolotow, Maurice. "Guys, Dolls and Runyon". The New York Times, Nov. 12, 1950, Section 2, p. 1,3. ↑ Herrmann, Dorothy (1982). With Malice Toward All. New York: G. P. Putnam’s Sons. pp. 60–61. 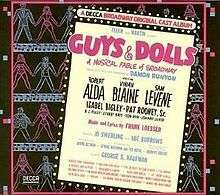 ↑ Guys and Dolls | IBDB: The official source for Broadway Information. IBDB. Retrieved on 2012-05-21. ↑ Norton, Richard C. A Chronology of American Musical Theater: 1952 - 2001, Volume 3 Oxford Univ. Press, 2002. p. 33. ↑ "Guys and Dolls (City Center Revival, 1955)" broadwayworld.com 2011. Last accessed 22 Mar 2011. ↑ Eyre, Richard. "Directing the National Theatre Guys and Dolls." In: Loesser, Frank, et al. 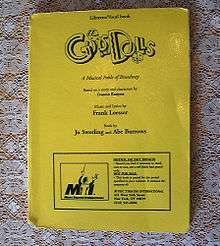 The Guys and Dolls Book. Methuen, 1982. p. 36. ↑ Mordden, Ethan. Broadway Babies: The People Who Made the American Musical. Oxford University Press US, 1988. p. 230. ↑ Battersby, Kate. "The Cast Were in Shock at the Avalanche of Appreciation." The Telegraph. May 31, 2005. ↑ Kullman, Colby H. and William C. Young. Theatre Companies of the World, Volume 1. Greenwood Press, 1986. p. 691. ↑ "Huge Team Help Stage Revival of Broadway's Guys and Dolls." The Bath Chronicle. April 21, 2011. ↑ Scottish Field, Volume 131. Holmes McDougall, 1985. ↑ Benedict, David. "Good Night, Sweet Prince." The Independent. 6 January 1995. ↑ Vincentelli, Elisabeth. "This Revival is a Bad Bet: Guys & Dolls Bores in Broadway Return." New York Post. March 2, 2009. ↑ Lahr, John. "Broadway Boogie-Woogie: Guys and Dolls Rolls the Dice Again." The New Yorker. March 9, 2009. ↑ "Full casting announced for Guys and Dolls at the Savoy Theatre in London's West End". www.londontheatre.co.uk. Retrieved 2016-01-15. ↑ "GUYS AND DOLLS Confirmed to Transfer to the Phoenix Theatre!". Retrieved 2016-01-29. ↑ Boehm, Mike. “A 'Guys and Dolls' Just Like Harlem” latimes.com, April 14, 2002. ↑ Jones, Kenneth, and Robert Simonson. “Indian Ink, Cabaret Lead 2000 Helen Hayes Award Winners” playbill.com, May 9, 2000. ↑ Simonson, Robert, and Christine Ehren. “Arena Stage Guys and Dolls to Tour U.S. Starting Fall 2001; Goal Is Bway” playbill.com, Jan. 23, 2001. ↑ Simonson, Robert. “National Tour of Hines Guys and Dolls to Begin Aug. 28” playbill.com, May 10, 2001. ↑ Jones, Kenneth, and Robert Simonson. “Still Rockin' the Boat: Touring Guys and Dolls Gets Cast Album Nov. 6” playbill.com, Nov. 6, 2001. ↑ Gans, Andrew. “Bernadette Peters, Hairspray and Millie Among Grammy Nominees” playbill.com, Jan. 7, 2003. ↑ Mahoney, Elisabeth. "Guys and Dolls – Review: New Theatre, Cardiff". The Guardian. 16 March 2011. ↑ "Stand Up, They're Rocking the Boat, Like 1950 Again : 'Guys and Dolls' Is Performed as a Benefit for Carnegie Hall". The New York Times. Retrieved 2014-06-06. ↑ Fleming Jr., Mike "Fox Seals ‘Guys And Dolls’ Rights; Wants Channing Tatum, Joseph Gordon-Levitt To Fill Frank Sinatra And Marlon Brando Shoes." Deadline.com (April 24, 2013). Davis, Lee. "The Indestructible Icon". ShowMusic. Winter 2000–01: 17–24, 61–63. Loesser, Susan (1993). : A Most Remarkable Fella: Frank Loesser and the Guys and Dolls in His Life. New York: Donald I. Fine. ISBN 0-634-00927-3. Stempel, Larry (2010). Showtime: A History of the Broadway Musical Theater. New York: W. W. Norton and Company. ISBN 0-393-92906-X.